With Southern Belle's vacation rentals Tybee Island GA, you can live like a local and explore all the surrounding attractions and restaurants while having a private, cozy spot to return to. One of our newest Tybee Island vacation homes is the Pink Flamingo, an adorable cottage featuring tidal creek and marsh views. This house is about 1,200 square feet and offers sleeping arrangements for eight guests in three bedrooms with two bathrooms. Our vacation rentals Tybee Island GA are always packed with thoughtful amenities and this one is no different. Inside, you'll find one queen size master suite that includes its own bathroom, plus two queen size guest bedrooms as well as a nearby bathroom. A convenient sofa bed pulls out in the living room to provide additional sleeping space. The property also has a full size washer and dryer, gas grill, flat screen TVs, outdoor seating, amazing marsh views and easy access to Tybee's attractions. The cozy living room of this cottage features comfortable seating, a ceiling fan, expansive flat screen TV, nautical art and decor, plus large windows to let in plenty of island sunshine. Just off the living room is a dining room with seating for six and dangling pendant chandeliers. Go a bit further to find the full kitchen, featuring double sinks, full-size refrigerator and stove, microwave, a stacked washer and dryer and space to prepare meals. The entire house features rustic wood floors with area rugs in spots to accent. It's difficult to resist the charming nautical beach atmosphere in this cottage, and you'll feel like a local in no time. Experience the historic north end of Tybee Island with Southern Belle's Tybee Island vacation homes. The north end of Tybee is home to the island's light station and museum as well as Fort Screven and the northern beaches. Fort Screven served as a military watch station from 1897 until 1947 when it was finally closed and sold to Tybee. The Fort Screven Battery Garland is now the Tybee Island Museum, but in the fort's operational period it was a gun battery and magazine. The museum now offers guests a look at 400 years of history of Tybee Island and the surrounding areas. When you buy a ticket to access the museum, you also get access to the nearby Tybee Lighthouse. 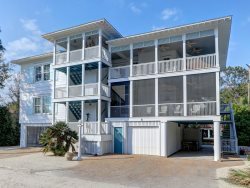 Although the entire island is easily traversable no matter where you stay, vacation rentals Tybee Island GA put you near some specific attractions alongside the aforementioned lighthouse and former fort. The Tybee Post Theater is also in the Fort Screven Historic District. Once upon a time, it was the movie theater for soldiers and their families staying in the fort in the 1930s. It was one of the first theaters in the state to have the technology for talking movies. The theater was nearly demolished in 2001, but was saved by the Tybee Historical Society and reopened in 2015. It hosts both movies and events. The theater's concession stand even offers beer and wine. The North Beach on Tybee is known for being quiet and scenic. Avoid the crowds on the south beaches and instead spend a relaxing afternoon looking for shells, watching dolphins and observing the merchant traffic coming into the port from the Atlantic Ocean. After spending time on the beach, you can hop over to the North Beach Bar and Grill for beachfront eats with a Caribbean theme. When you venture south on Tybee, make sure to check out the Marine Science Center for information on the island's fascinating ecology. Book your favorite Tybee vacation rentals with Southern Belle and get ready to embark upon the trip of a lifetime. You can find a huge selection of properties on our website and then make a reservation right from the page or give us a call.
. It felt like home away from home. A very quiet neighborhood and nice neighbors.